Because now we've smartphones that support as many as three SIM cards. People often wonder whether it’s possible to use two WhatsApp in one phone. Gone or the days when people had a single number. Now, we’ve smartphones that support as much as three SIM cards. Although people use different numbers for different purposes, they often run into situations where they need to have multiple WhatsApp accounts associated with their numbers. First of all, remember that WhatsApp is yet to allow users access multiple accounts using a single device. But like anything else, there are ways to do it on your phone. So, what makes it possible? Let’s find out. Step 1: In our case, we’ve been using a Xiaomi device running MIUI 8. One of the notable features of MIUI 8 is dual apps support. As a result, we are able to use the feature to clone apps that are already installed on the device. If you are MIUI 8 user, navigate to Settings > App Settings > Dual apps. Step 2: Select the app you want to clone, which in our case was WhatsApp. Once done, a new Facebook-owned instant messenger clone app icon appeared on the home screen. These are some of the smartphones to support dual apps: Samsung Galaxy J (2017), Lenovo P2, etc. 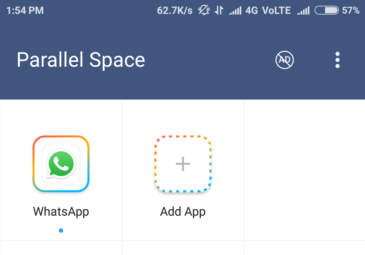 Step 3: Another option is to download and install Parallel Space app from the Play Store. Once the app is installed, tap the ‘Add App’ option and select WhatsApp. You can start using the secondary number on WhatsApp clone app inside Parallel Space app. Since that WhatsApp doesn’t officially allow users access two accounts within the app at this point, what we’ve mentioned above is something that may come handy. Also, not all phones come with dual apps support as well. In that case, make sure to install Parallel Space app from the Play Store.